Two species of bacteria, Pseudomonas spp. & Xanthomonas spp. cause what is called bacterial leaf spot disease on a number of plants. Spots caused by Pseudomonas are reddish brown and may cause the leaf to distort. 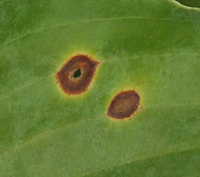 Xanthomonas infections cause small brown angular to circular spots with yellow halos. Occasionally, these bacteria will also cause dead spots on the foliage and/ or fruit. Sometimes cankers will appear on the stems of plants too. The most common approach to bacterial leaf spot problems is the use of sanitation. The bacteria are generally weak and must over-winter in the old, infected foliage. So, if you have this problem, clean up the dead foliage and dispose of it away from the garden...and the compost pile. If spots have developed on plants, avoid overhead watering since the splashing water can often move bacteria to nearby plants. As with other bacterial diseases of plants, there are not good antibiotics that are effective. Fungicides are NOT appropriate for use on bacterial leaf spot. See prevention above.